Y was 12 years old when he was referred to me by his psychiatrist. "He refuses to go into the classroom for 2 weeks now," his mother told me on the phone in a low, sad voice. "We practically have to push him in, with the teacher's help, and it's not easy, he's a big boy already. And when he does get in finally, we have to go through the whole circus again the next hour." It turned out that Y was an only child. He was a good and quiet boy, who played computer games after school, never went outdoors or met with friends – "but this is how children are nowadays, right?" He rarely did anything fun with his parents, since it seemed everyone was most satisfied with staying home. "Everything was just fine," said his mother, lost and confused, "but now he says he wants to kill himself." My heart sunk. Difficult age, and difficult symptoms. I hoped the SSRIs would help. Y proved to be bright, talkative and even slightly lively as long as I did not direct the conversation to the steps necessary for his improvement. Whenever he felt pushed to action, or even to a discussion about improving, he would look at the floor and stubbornly shrug in silence at every question, thought or suggestion I made. This avoidant mode was a constant dead end. Like his parents, Y could tell no clear story about the trigger or the process that started all this. But he was determined not go to back to school. "I'd much rather stay home with my computer. Besides," he added with no sign of humor, "this gets me lots of attention and I sure need that." Still, he readilywalked the path with me when I tried to conceptualize his modes. 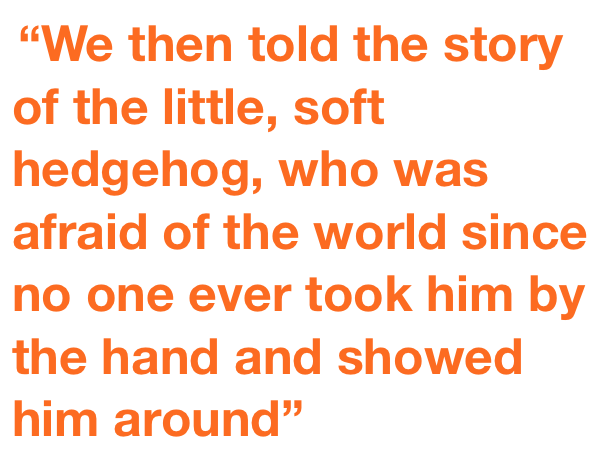 We then told the story of the little, soft hedgehog, who was afraid of the world since no one ever took him by the hand and showed him around. To protect himself, the fearful hedgehog covered himself with prickles and rolled himself to a small ball. That felt safe. Lately, he realized Prickles also gets him the attention and availability of his parents. That sure felt safe. And nice. 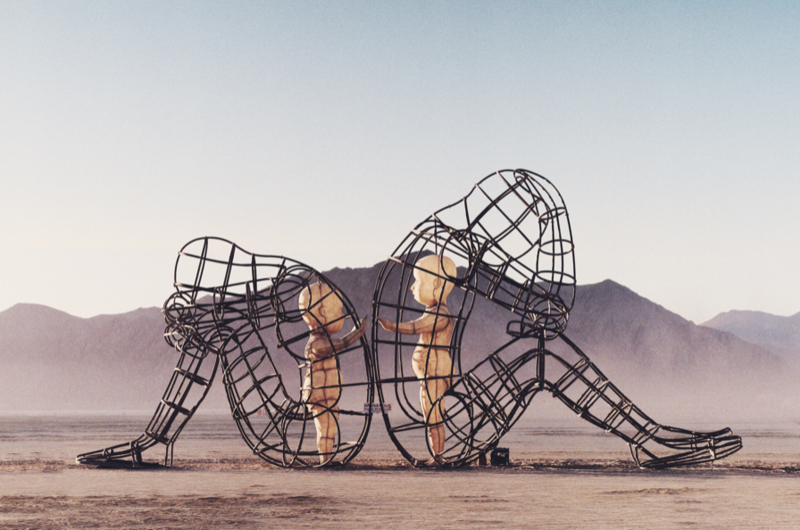 This gave us a kind of private vocabulary, to describe the vulnerable child and the avoidant coping mode, but I still had no idea how to get Y out of his prickles mode, that often got us stuck in sessions. Still, the medication was helping, as well as the efforts his parents and the school put in. He was given a special assistant, a woman whose job was to help him get into class and stay there – for he sometimes left class in the middle of a lesson, overwhelmed by something that had happened (such as the teacher announcing an exam was coming up later in the week), and wasn't able to get back in. 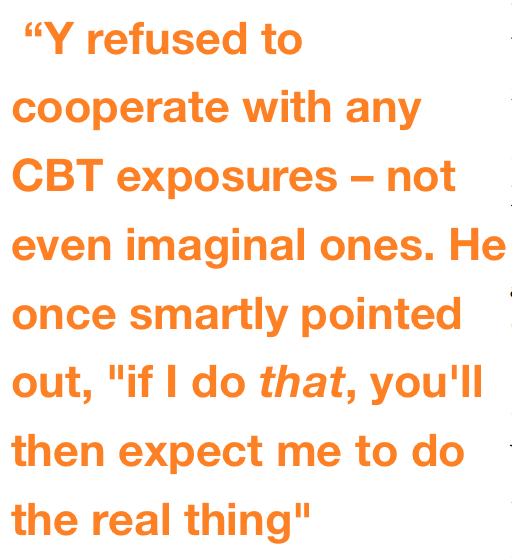 Y refused to cooperate with any CBT exposures – not even imaginal ones. He once smartly pointed out, "if I do that, you'll then expect me to do the real thing". But usually there could not even be a discussion. He would go into Prickles and cease talking. In one such session, desperate to get him out of Prickles, I wrote on a piece of paper – "Hey. I know you are there. I know you want me to reach you". I then rolled it to a ball and threw at him. Instinctively, he caught the paper ball. He was too curious not to read it. Encouraged, I went on. "It's not easy but I'll keep on trying". Throw. Catch. "I won't give up on you. Because I remember the little hedgehog inside needs someone to be with him." Throw. Catch. I could see that the physical motion did some change. It began to melt the avoidance. I could see he is waiting for my next ball of paper, and that his eyes are filling up. "I know he can hear me. I know he can see me." Throw. Catch. The transformation of modes in front of my eyes reminded me of my children, who would sometimes bury each other in sand on the beach, only to suddenly rise up laughing, shaking off the sand – "Here I am, Mummy! Did you see me?" I brought a real soft, small ball to our next session, and also a bunch of playing cards. These proved to be very helpful. Playing consistently pulled Y out of Prickles. This opened the way to discuss his daily life avoidance in much more depth, since the conversation was not in danger to get stuck anymore. I never used the games to give interpretations, like in classical dynamic play-therapy, since I didn't want to elicit self-consciousness in Y during the game. So playfulness was one key to defeat avoidance (with older avoidant patients, playfulness was achieved through enthusiastic discussions about their special area of interest, such as physics or movies). I tried to lean again on attachment statements, like I did with the paper ball, but that worked only now and then. Maybe I wasn't always as genuine as in the first episode. It was only much later that we found that another antidote for Prickles was emotions – any kind of them. It didn't have to be joy – like in the case of games, or sadness like in the case of my paper balls. I recall once, Y came in prickled, but was slowly able to tell me that his mother didn't emotionally support him after failing a test (which was not like her). Being able to feel his anger, pulled him out of Prickles. Another element that helped in this paper ball episode, was the feeling that some significant other was available. That helped a lot later in therapy, when Y faced advanced challenges such as going on a field trip with his class, or inviting friends over. The nature of the availability would change in the course of therapy, from very concrete and immediate to a more subtle one. Curiosity was also a helpful element. In the paper ball episode, Y was curious to read what I'd written. In a way, curiosity is the opposite of avoidance, since it promotes going towards, rather than going away. I used it later in therapy through introducing new games, as well as encouraging his parents to initiate activities that he would perceive as new and compelling. After reading the case study, Y asked to add another component which helped in his view to melt down the avoidance: a sense of belonging, feeling a part of something bigger than himself. Y's parents made great efforts to find activities that would take him out of his comfort zone. He volunteered in an animal's farm, and joined a summer camp of young scientists. They went on several hikes, and got a dog, who made it necessary for Y to get out of the house daily. But although Y seemed to enjoy all these activities, he heavily relied on his parents to force him to do them, just as in school he relied on the assistant to get him into his classes, and just like in the sessions it was always me who initiated playing when Prickles came to town. He still took no responsibility over his mode shifts. But the positive exposure to the outside world did have an effect. Y got attention from his parents not through Prickles alone, and also came to like some of these activities and was disappointed when Prickles got in his way of engaging in them. He was now willing to describe Prickles as a "kidnapper", and discuss ways to "escape captivity". We came to know "Mature Y", who can command the actions needed to free the Hedgehog and himself from "prison". Still concerned about his lack of responsibility and initiative, I asked him in the beginning of the school year to set goals for this year. Y said he would like to be able to visit friends from school and have them come over, since having activities with his parents at his age is usually "boring" or plain "weird". He was also willing to reduce his reliance on the school assistant. I wrote that on a piece of paper. Later on in therapy, Y denied this will many times when he was "prickled", but I was able to wave my piece of paper, claiming this was the will of Mature Y, and only when he is present we can discuss changes in it. This was the beginning of a long, ongoing way, for Y to take over his process. Today, Y is seeing friends regularly, and does not need the help of the school assistant anymore. He participates in extra-curriculum activities, and goes to gym frequently. He still struggles with Prickles. It was only recently that his friends knocked on his door, causing him such a wave of panic, he hid silently in the house, hugging his dog. But after they were gone, he was able to call his father and ask for his help to join them. The work I've done so far with Y consisted mainly of weakening the avoidant coping mode, and strengthening the happy child and the adult mode. Now more work is needed – especially for the weakening of the critical parent mode, and weakening the compliant coping mode, thus strengthening his assertiveness. This lineup is not meant to be a protocol, and may or may not be applicable for other avoidant patients. My main aim was to demonstrate different ways for weakening the avoidant coping mode, which oftentimes obstructs the therapeutic work.